Gen. James T. Conway, Commandant of the U.S. Marine Corps, speaks to a crowd on Dec. 18 at Lockheed Martin in Fort Worth, Texas, during the roll-out ceremony for the first F-35B Lightning II. The F-35B is the short takeoff/vertical landing variant of the supersonic, stealth fighter, and will be used by the Marine Corps, the United Kingdom and Italy. 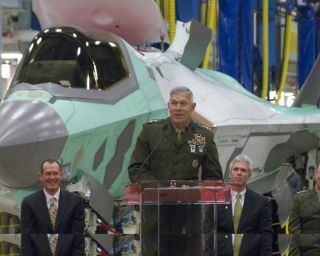 The USMC will be the first service to have the F-35 in operation, in 2012. Flight-testingof the vertical-landing version of the F-35 Lightning II is on course for Mayfollowing Lockheed Martin's public unveiling of the first production-standard F-35Bon Tuesday at its plant in Fort Worth, Texas. Engine ground-testingof the first production F-35B short takeoff/vertical landing (STOVL) LightningII will begin in March, using an aircraft designated BF-1, said Bill Gostic,vice president of Pratt & Whitney's (P&W's) F135 engine program. In theinterim, two F135 STOVL engines -- one at a P&W facility in Florida and the other at the U.S. Air Force's Arnold Engineering Development Center in Tullahoma, Tenn. -- will complete 600 to 700 hours of ground-running to completequalification testing of the F-35B's STOVL propulsion system, Gostic said. The F135 isthe engine that powered the Concept Development Aircraft with which Lockheed Martin won the Pentagon's JointStrike Fighter competition to design an aircraft that could be developed inthree different versions for the U.S. Air Force, the Marine Corps and the Navy. Developedfrom the F119 that powers the F-22 Raptor, the F135 also is the engine that has powered the conventional-takeoff-and-landing(CTOL) F-35A since it became the first F-35 variant to fly on Dec. 15, 2006. Producing 40,000pounds of thrust with afterburner -- officially known as "maximumaugmented thrust" -- for conventional takeoff and maneuvering, the F135also can develop 40,000 pounds of thrust without afterburner for STOVLtakeoffs and landings. It does so by running hotter under the command of P&W-developedengine control software. The F135 isthe most powerful fighter jet engine in the world, according to P&W. In April,the first F-35B is due to go to the "hover pit" that Lockheed Martinhas built at its Fort Worth plant, said Gostic. A large, concrete-lined hole inthe ground covered by a steel grating, the hover pit will allow Lockheed Martinto test the F-35B's STOVL propulsion system at full power while the aircraft ison the ground, safely tied down to the steel grating. The F-35Bis scheduled to make its first flight, a CTOL flight, on May 23, 2008. "Duringthe summer and into the fall, the flight tests transition from CTOL tosemi-STOVL (flights), and ultimately to vertical landings," said Gostic.Later, flight-testing will move from Lockheed Martin's facility, probably tothe Navy and Marine Corps test center at Naval Air Station Patuxent River, Md. While theF-35B is designed to require a short takeoff run when carrying a full load offuel and munitions, when lightly loaded or empty it will be quite capable of takingoff vertically, Gostic confirmed. The U.S. MarineCorps will fly the F-35B, while the Air Force will operate the F-35A. The U.S. Navywill fly the F-35C, a version with a strengthened landing gear and a tailhookso it can be operated from aircraft carriers. Inaddition, the Royal Air Force, the Royal Navy and the Italian Air Force andItalian Navy will operate the STOVL F-35B. The Dutch Air Force also is aprospective customer for the F-35. Itsselection by all three major arms of the U.S. forces is not all that makes the super-high-techF-35 unique on the military scene: The aircraft has been designed to allow anunprecedented degree of commonality and interchangeability of parts among thethree versions. Thatincludes its propulsion system. Not only will all the F135 engines poweringeach of the three versions of the F-35 be identical, they also will becompletely interchangeable among different forces' aircraft. So the F135powering a U.S. Air Force F-35A could, say, be interchanged successfully withthe F135 powering an Italian air force F-35B. There'smore. The Pentagon has required that two engine types, Pratt & Whitney'sF135 and the General Electric/Rolls-Royce F136, be developed for the F-35.Uniquely, however, it also has mandated that the two engines have an identicaldesign specification, so that all F135s and F136s will be interchangeable inall F-35s, said Gostic. "Thetwo engines will also operate with common components," he said. Pratt &Whitney's F135 has about a five-year development lead over the F136, so it powerthe first F-35As, which will be procured by the U.S. Air Force in fiscal year 2009. It alsowill power the first F-35Bs for the Marine Corps (for FY2010 procurement) andthe first F-35Cs for the U.S. Navy (in procurement/delivery year 4). The UK and the Italian forces are also due to buy their first F-35Bs in year 3 or 4, so theirfirst aircraft will be powered by F135s too. Flight-testingof the F135-powered CTOL F-35A will continue while the F-35B's F135 STOVLpropulsion system is completing its qualification ground-testing. F-35A flight testinghas already confirmed that "the full throttle range, whether dry oraugmented with afterburner," is available, said Gostic. The F-35Aflight-test schedule calls for two more flights this year, with near-termtesting finding out "how the aircraft handles in formation with a tanker"during aerial refueling, he said. This is toprepare for ferrying the first production F-35A -- which is designated AA-1 --to Edwards Air Force Base, Calif., in the first quarter of 2008. At EdwardsAFB, flight-testing will "expand the flight envelope," establishingspeed, altitude and systems flight parameters for the F-35A, said Gostic.